My son passed this one along: a video from What's the Mashup that has clips from no less than 100 movies all cut, right to the beat, to Uptown Funk. Which movies, you might ask? You can read the list in the notes section here. The screenplay is dense and rapidly spoken; it actually felt a lot like a play, as it's in three acts, all set in closed spaced at three specific points in time. I first used Apple products in the 80s, am peculiar enough to have loved the G3 iMac I worked with after it was introduced in 98, and now live in a house with multiple Apple laptops, tablets, phones and things, so the details and specificity in Aaron Sorkin's script were impressive. Yet, the humanity of the story - a stubborn man's reluctance to let himself love his own child - is what binds it together. "I was surprised as anyone when T-shirts, jeans and leather jackets suddenly became symbols of rebellion." We have some favourite movies in our house that get hauled out before and especially after Christmas. Familiarity doesn't breed contempt; with a few of them, it's hard to even count how many times they've been seen. 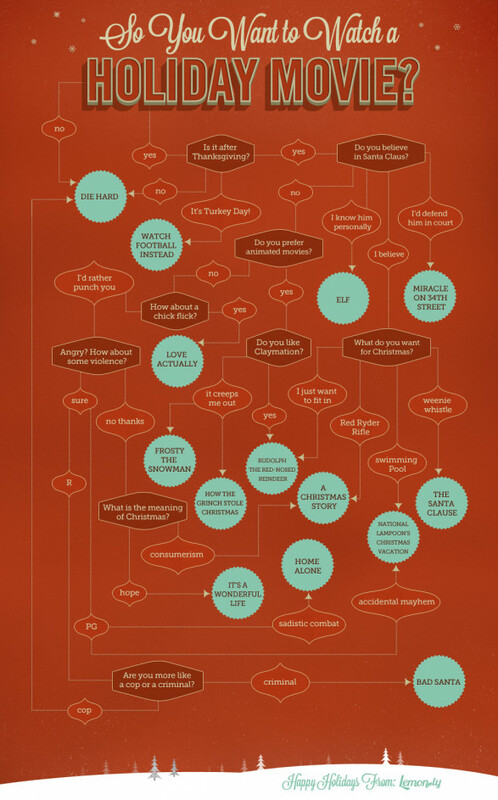 I got a kick out of this flowchart. My son was roaring over this parody trailer of Home Alone; he was plenty eager to show it to me. With Tina Fey saying, "Put the frog down," how can you go wrong? Here's one for the movie buffs ... and for anyone who's ever wondered why the shape of cinema screens has evolved. I got a kick out of this collection of food photos that not only have creative uses for veggies, but are hilarious too. It was the age of 3D ... the first time around. This parody is just one of a hilarious set that movie buffs should check out when they have a second. Mick Jagger as James Bond, anyone? I somehow missed Hot Fuzz when it came out, and thereafter ... until now. Nick and I watched it this evening, and laughed ourselves silly. My teenage son and I watched Pulp Fiction last weekend (Martha, who is not that much of a fan, was at a social gathering). I hadn't seen the movie in years, and Nick had been wanting to see it, if only to place various parodies, including those on the Simpsons and Community, into context. There were definitely as many swear words as I remembered, but oddly not as much violence. The movie, I guess, had become more brutal in filtered recollection as the years went by. Still just as funny, though. Here's a chart from Laughing Squid, showing the evidently very careful research that someone did on the body count of one of the most violence-approving directors of them all. I actually liked how Christopher Nolan wrapped up his Batman trilogy, but I still got a laugh out of the Honest Trailers take on The Dark Knight Rises. Olly Moss created this remarkable poster that says something, often subtly, about each of the Best Picture winners so far. The Artist, for instance, is in black and white. Some were probably obvious (Hannibal Lecter's straitjacket, Lawrence of Arabia's robes), although I was stumped for a second as to why the one for 2001 appeared to be missing ... until I remembered that A Beautiful Mind won for that year. How many can you spot quickly? Click on the image to get a larger view. If you need a guide, or a prompt, here's a list of all the Best Picture winners.